Samurai Japan beat (9-2) CPBL All Stars. "Baseball is not only a game, but part of the Japanese Culture"
Samurai Japan (an All Star team of the NPB, the Japanese Major Leagues) beat the All Stars of the CPBL (the professional League in Chinese Taipei) 9-2 in a charity game played Saturday 3/10 at the Tokyo Dome in front of a 35,505 fans in attendance. The game was meant as a fundraiser for the victims of the earthquake and tsunami of March 2011. A total of 12,000 tickets were give to residents from disaster struck areas. It was the first time NPB has invited the CPBL to Japan. Hiroshima Carp slugger Kenta Kurihara, a native of the Region of Tohoku, devasted by the earthquake, got a two-run homer in the third inning that set the pace for Samurai Japan. "For me this game means more" told Kurihara to the 'Japan Times'. To make the event even more symbolic, Rakuten Golden Eagles (a team from the Tohoku Region) star pitcher Masahiro Tanaka earned the win. Prior to the game, Hanshin Tigers star Takahiro Arai (the Head of the Players Union) urged everyone to continue to do their part to help the relief efforts. Popular vocalist Masayuki Suzuki sang 'Kimigayo', the National Anthem of Japan since 1868. IBAF President Riccardo Fraccari attended the game. This was the main purpose of his travel to Far East. "I wanted to express the solidarity of the IBAF" said Fraccari to the japanese press "And of the whole baseball community. I was very impressed by the words of Commissioner Kato" added Fraccari "When he said that baseball is not only a sport here, but part of the Japanese culture". This led the IBAF President to confirm the organization's strong relation with NPB. At this point came questions about Olympic Reinstatement. "It's not an easy task" admitted Fraccari "When I started my term at IBAF, I immediately tried to understand why baseball was not in the Olympics program. I am convinced that we need to show the IOC that baseball is a global sport, not only an American game. The IOC asks us to have the best players represent their countries in the Olympics and we know that the best players do not only mean MLB players". 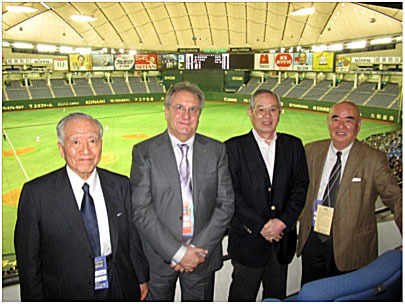 Fraccari updated the Japanese media on the direction his IBAF is following: "During our Congress in Dallas in December 2011 we approved a new tournament plan. The World Baseball Classic now has a qualifying system, so 28 teams participate in the event and not 16 as it was in the first 2 editions. We will have an 18 and Under Classic also. These tournaments will award the winners with the World Champion title. We are also working to improve the 12 and Under and 15 and Under World Cups and we will work to launch a 21 and Under World Cup and the Premier 12, a tournament for the best teams of the World Baseball Classic". On the role of NPB Fraccari said: "NPB made the first step with the Samurai Japan. They want to participate in this project and we will try to accomodate the schedule to the needs of these professional leagues".